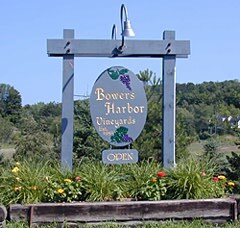 Our family at Bowers Harbor Vineyards invites you to explore the epic views of Lake Michigan and sample our award winning varietal wines. We are a boutique winery located in Northern Michigan on picturesque Old Mission Peninsula in Traverse City. Our cool-climate viticulture experience coupled with our hard work proves to produce superior quality Pinot Grigio, Chardonnay, Riesling, Pinot Noir, Cabernet Franc, and our signature meritage blend the 2896, Langley Vineyard. We planted our first vines in 1991, and we are excited to be apart of Michigan’s growing wine tourism. Because we care for our land sustainably, our vineyards have been recognized by the Michigan Agriculture Environmental Assurance Program. Come taste our passion!